Defying Autism. Interview with the Author! You have a real mix of talents in addition to being an author. Will you please tell us about yourself? I am a stand up comic and speaker with a passion to impart truth and hope to people and to remind them that God is still purposed to have them move into their destiny. 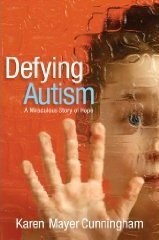 Your new book, Defying Autism, is about your son, James. Will you tell us a little about him? James is my first born, the apple of my eye. He was born right on time, perfect in every way. He progressed and hit all of the appropriate markers ahead of time. He was one of those vey easy babies that you could pass to anyone and he was still a happy baby. He was pointing and babbling at a year, and into everything! He sounds adorable! At what point, did you start to notice that something was wrong? We took James in for his 18-month check up and shots, after which his behavior took a dramatic, turn for the worse. When we brought him home, he would run to the same spot in the hall and stand with his back to the wall and slam his head backwards into the sheetrock. To say this was upsetting was an understatement, but then I thought maybe this is the dreaded terrible twos, or little boys are rough. So we would redirect him and send him on his way. The redirecting stopped working; it was though he could not stop behaving this way. He had many other strange habits, obsessive behaviors that began to appear. He would eat the little pieces of sheetrock, where he had actually put a hole in the sheetrock, he pulled the wallpaper off and ate it, he pulled up the corners of the carpet and ate the foam underneath it, he ate the rubber lining out of our car doors, he watched videos for hours standing in front of the TV. What did you do? Who did you go to for help? First we went to other parents of children. I owned a salon so I had the free advice every hour from women who had “already been through it”. I wanted to believe as they all said, that this is a phase, this is the two’s, little boys do strange things. We then went to professionals, pediatricians, speech therapists, ENT specialist, pediatric specialist, state agencies, MHMR and of course our church for lots and lots of prayer. What can you tell us about autism? Autism is a severely handicapping disorder that begins at birth or with in the first two and half years of life. For many years autism occurred in 5 out of 10,000 births, however since the early 1990’s the rate is now calculated at 1 in 150 births. Most autistic children are perfectly normal in appearance, but spend their time in disturbing behaviors, which are marked differently from those of normal children. They may stare into space for hours, throw uncontrollable tantrums, show no interest in people including their parents, and pursue strange repetitive activities with no apparent purpose. They have been described as living in a world of their own. Some autistic children have remarkable giftings in certain areas such as music or mathematics, and all need help. My greatest fear was losing my child at five or ten years, or as an adult, to an institution. I would watch the movie Rain Main over and over again and assume that would be the best outcome for my son. What was a typical day like for you and your family? A typical day for us would be James up before we woke with a video in and grunting for what he wanted. He would only eat a few foods, several times a day he would throw up to let you know he didn’t want or like something. Crying, tantrums and fits filled the day from sun up to bedtime. His fits had no beginning and sometimes it felt as if there would be no end. In the spring of 2000, when he was almost 6, he was still in a diaper, on a bottle and only spoke 20 words. School did help James; he did much better with a strict structured environment. The opposite of that however, is that it is hard to duplicate that environment at home with a family. School helped James academically, but not emotionally or socially. Did church help James, or you? Unfortunately, church did not help James at all. My husband and I were music ministers and would fill-in at churches that were looking for a fulltime staff person. This meant a lot of changes every few months – new locations, new staff, and new strange glares inferring what a bad mother I must be for my baby boy to behave in such a way. Church turned into a place I dreaded and had been such a place of family and belonging before. What was the turning point for you in this journey? Having heard the weekly cry of my heart for help for my child, one of my clients recommended a ministry team, a deliverance team, Gospel Revelation Ministries. I didn’t know what deliverance was, but I had no doubt I needed some. I went through personal deliverance and then followed with James in the spring of 2000. I was terrified but they said that God said he was going to be healed, so I stood with their faith. As we brought James into to the room for deliverance, he began to thrash and point to the door to leave, he was ready to go. The team prayed and laid hands on him. They said that the first demonic curse would have to go in Jesus’ name to the dry places. With that, my son reached his hand out and screamed, “come back, come back, come back, come back!! !” He was calling out for the demons that were leaving him. That was the turning point! The first thing I did was the most difficult. I changed my mind. I changed what I believed that God could –and would – do if petitioned. I changed what I thought about the stories in the Bible. I changed my belief in what is available to us, TODAY, by the sacrifice of Jesus on the cross. When I began to be open to the truth of the scriptures, and not just what someone else said I should believe, or someone else’s interpretation of the scriptures for me, then…the Word of God began to truly be a light unto my path. That was several years ago. How is James today? James is wonderful! He is 15 years old going in to the 9th grade. He’s six feet tall and an amazing athlete. God’s promise is that he will restore our minds daily and James has caught up with remarkable speed. He is still about 2 ½ years behind academically, and in three resource classes, but is making up lost ground daily. He is completely healed from the oppression of autism. Doctors say it is something, maybe higher than what they have in the medical field. It is nothing short of a miracle! What can families hope for who have children with autism? Families can believe and stand for their loved one’s healing. Jesus is in the miracle working business. He healed James. James’ story could be anyone’s story. I was not the “good” Christian, but I stood, no matter what, believing for my child’s healing. Your healing may be through diet, environmental changes, behavioral changes, or even the way James was healed. However it comes, do not waver from the promises of God. Exodus 15 says, “I am the Lord your God who heals all of your diseases.” He is Jehovah Rapha, our God who heals. If it is in His name, it is in His will! Karen, where can our readers get a copy of your book, or find out how to have you come and speak for their group or organization? They can find out more about my book and speaking information on my website at KarenMayer.org. I would love to hear from any of you who are dealing with autism in your family or among your friends. I hope you are encouraged by our story – that there is hope, healing, and freedom for your situation. The ups and downs of life have taught Karen Mayer Cunningham that laughter really is the best medicine for what ails you. Her passionate narratives can as easily make you laugh as they can move you to tears. Karen draws many of her stories from her daily life and more specifically from being the mother of a severely autistic son. More than once Karen wondered how she would face the trials that crossed her path. The weight of the responsibility of a handicapped child, became the cross roads of her life. Her story of how God super-naturally altered and prospered her life will uplift and refresh you. Whether she is opening for a Grammy award winning musician, redirecting a sales force or lifting up the hearts of a women’s encounter, she cuts through with comedy and clarity; challenging others to take it up a notch or two. Karen knows that through he release of emotions you will internalize her message of possessing the promises and purposes of God, that will take you on the road to truly joyful living. 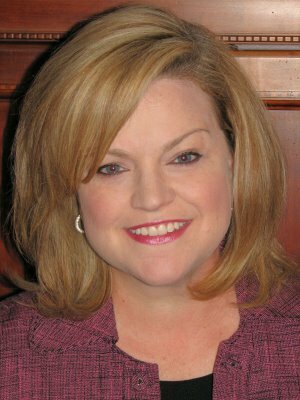 Karen is a gifted stand-up comic, motivator, and author. She and her husband, Cortney, live in Houston with their three beautiful children, James, Paige, and Caden. I want to encourage my readers, whether or not you have a child, grandchild (like I do), or know someone with this illness, this book is a must! With incredible honesty, Karen reveals how she dealt with, or rather ran from the problems throughout the beginning of this journey. When I received this book, I read it through—I could not put it down! She captivated me from the first chapter! It not only gave me hope for Rylan’s issues, but hope in other areas of our lives! This book will bless your heart and give you a new perspective if you work with children in church nurseries, daycare, or youth groups! Don’t forget to leave a comment to be included in the “giveaway”! This entry was posted on Monday, June 22nd, 2009 at 12:01 am	and posted in Book Review. You can follow any responses to this entry through the RSS 2.0 feed. Thank you for sharing information about this book…I hope to receive this book! I can't wait to read this. I have really struggled with the fact that Rylan has autism. For so long I just didn't want to believe it. I believe God can heal Rylan just like he did James!!! GIRL….I'm sooooo happy to be back!! MISSED you!! we WILL chat soon!! I can see the laundry room floor!! WHOOOO HOOOOO!! MAN, can those people wear some clothes! I would love to read this book….